Are you stuck with your coding because you have a byte array and next method in chain needs an InputStream? don't worry Java has solution for that, You can use ByteArrayInputStream to convert byte array to InputStream in Java. This class takes a byte array as source and since it's a sub-class of InputStream, you can easily pass this to any method, which accepts InputStream as parameter. Though most of the API like JDBC and File API allows you to read directly from InputStream, because this allows you to process an arbitrary content with limited heap space. You should take advantage of this and directly read from InputStream instead of getting byte array and then converting them back to InputStream. It's only for those situation, where you have a legacy code, which is no more maintained and updated. Similarly converting byte array to OutputStream is trivial. Since we use OutputStream to write something, it allows you to directly write byte array in it. Say you have got some messages from TCP socket and want to persist in file system, you can use OutputStream and FileOutputStream to write byte array directly. Earlier we had seen how to convert InputStream to byte array, In this article, we will see opposite of that by creating a simple example of converting byte array to InputStream in action. Here is our sample program, which first take a byte array from String for testing purpose. Anyway, always provide character encoding when converting String to bytes and vice-versa. To recreate scenario, I have created a static method, which converts an InputStream to String. This method is called streamToString(), which takes an InputStream and character encoding for reading text. We recreate the same String, which we had previously converted into byte array. Next part of this example shows, how can you write a byte array to an OutputStream. By the way, if you are not using try-with-resource statement, then don't forget to close Streams once you are through with it. It can be argued that, whether a method, which accepts an InputStream should close it or not, but I have closed it to be on safe side. Let me know what is your thought on this, because there is example of IO utility classes in both Apache Commons IO and Google Guava which closes stream and which doesn't close the stream passed to them. * Java Program to convert byte array to InputStream and OutputStream in Java. * Uses ByteArrayInputStream and ByteArrayOutputStream examples. You can see how our streamToString() method has converted InputStream to String, but real thing is before that, we have used ByteArrayInputStream to convert our byte array to InputStream in Java. 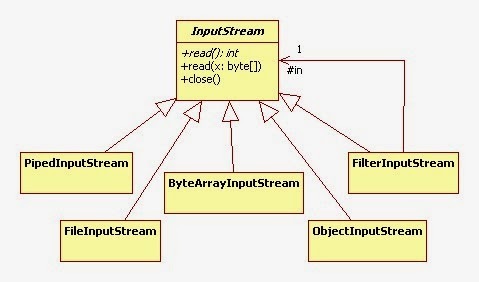 As I said ByteArrayInputStream is subclass of InputStream, you can pass or use it whenever a InputStream is required. This is also clear from class hierarchy diagram taken from java.io package, which shows different implementation of InputStream from JDK library. That's all about how to convert byte array to InputStream in Java. It might sound difficult initially, because of limited knowledge of java.io package, but it’s become very simple once you know there is a class called ByteArrayInputStream. Since it’s a child class of InputStream, you can pass it around in place of InputStream. Don't forget to provide character encoding if you are converting bytes to characters and close streams once you are done with them. Why don't you use try-with-resources instead of that verbose try-finally block?